It is with profound sadness that the family wishes to announce the passing of Myrtle Stanger, our beloved Mother. She slipped away peacefully to join our Dad in heaven and leaves behind a family that loved her greatly and were blessed by her love. She is survived by her children Jim (Eileen), Diane, Marilynn (Allen), Brian (Nancy), 8 grandchildren, 10 great- grandchildren, her sister Joan (Lee) and many loved nieces and nephews. Myrtle was predeceased by her husband Albert, brother Earle (McGillivray), and sister Isabelle (Sandmaier). 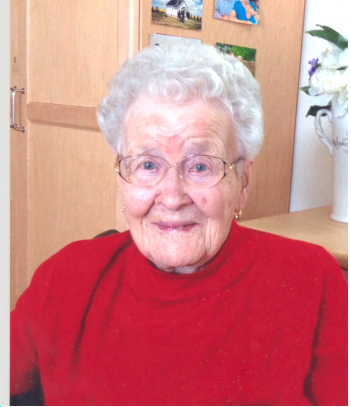 She was born in Sarnia, Ontario and came west in 1918, at age 5, to Provost, Alberta where her father homesteaded. After finishing her high school and Normal training in Camrose, she started her teaching career in one-room country schools during the depression. She met Al in Provost and they married in Edmonton in 1938. They moved to the Orkney district where they farmed and raised 4 children. She was very involved in the community and was devoted to the Orkney Presbyterian Church where she taught Sunday School for over 50 years. Myrtle had a lifelong interest in learning, in family history, and in keeping in touch with extended family. She and Al travelled extensively; Scotland, and Hawaii were favourite destinations. Myrtle had a long and rewarding life, blessed with good health and long lasting friendships. The family would like to thank the staff at Continuing Care and Helping Hands for their loving and compassionate care. The burial was held at the Sarcee Butte with a Celebration of Life following at Knox United church on April 6, 2019 at 1:00 P.M. In lieu of flowers donations may be made to the Drumheller Health Foundation (Continuing Care). Courtney-Winter’s Funeral Home were in care of the arrangements.